Two-DVD SALE bundle! Easy, short tai chi workjouts. Mirror-view tai chi moves to the left and right. David-Dorian's low-impact, whole body exercise can be done sitting or standing. No experience needed; beginner-friendly follow-along workout. Enjoy Tai Chi At Any Age! In Tai Chi Fit: OVER 50, Master-Teacher David-Dorian Ross leads you through a simple tai chi lesson. Perfect for any age, this follow-along routine is shown in a mirror-view format with nothing to memorize. Just follow along, and you'll enjoy the health benefits of tai chi, including improved mobility, balance, strength and flexibility. Perfect for seniors, those with limited mobility, or anyone looking for some gentle exercise, the OVER 50 workout combines basic tai chi moves and energizing qigong exercises for an easy, whole-body workout. You'll be relaxed and breathing deep in no time. Tai Chi Fit: OVER 50 allows anyone to experience the wonderful feeling and benefits of tai chi without the stress of needing to memorize the movements. Just follow along, have fun, and keep smiling! Keep your practice interesting with three 20-Minute Tai Chi Fit TO GO Workouts. 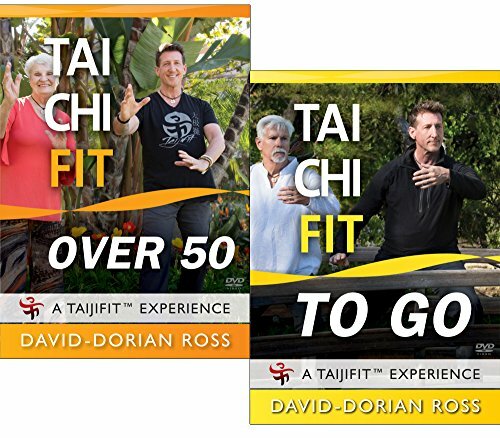 In Tai Chi Fit: TO GO, David-Dorian helps you to find time for your tai chi practice with three different 20-minute workouts. The moves are shown in mirror-view, repeated to the left and right before a simple transition takes you to the next step. What if you only have a short time for your tai chi workout? What if you only have limited space? The Tai Chi Fit: TO GO workouts are portable, "pocket-sized" sequences that you can do anytime, anywhere. This program is perfect for beginners and experienced tai chi practitioners wanting some relaxing exercise and a few moments of tranquility during your day.